Michele Herzog: Please Don't Be the Cause of A Fatality! Unfortunately, and sad to say, there was a mad rush to the abortuaries just prior to this catastrophic storm by women, wanting to hurry up and have their little baby boys and girls killed by abortion! As Allura and I pleaded with the women, we urged them to not be the cause of a fatality, which were horrifically taking place due to Irma. We exhorted them to leave this dark place of death with their child still snug in their womb, and prepare for the Hurricane. Allura stood at the driveway with car after car driving in to this parking lot, crying out, offering help, pleading for the life of these innocent children. "At this time when everybody is in survival mode, you've come to a place that kills precious little innocent children, children who were created in the image of God, and should enjoy the same rights of life, liberty and the pursuit of happiness that you enjoy!" I stood in the back pleading as well, with those hanging out smoking their cigarettes, or exiting their cars. I urged a young man that had been hired to hang the storm shutters, to refuse to do business with a place that dismembers or poisons to death innocent human beings. He told me that God had blessed him with this job because he needed money so bad.....and that he was a Christian! I told him that that was not a blessing, and if he did the work for them, he would be receiving blood money, and bring a curse instead of a blessing. He told me that he thought what we were doing was good, but that he had to do this job; I told him, "You will remember this day....the day I pleaded with you not to have anything to do with the unfruitful deeds of darkness, but rather expose them....but you chose not to expose them, but instead, to take part in the evil.....you will remember this day!" Our hearts wept watching woman after woman walk into those doors in a hurry to get this deadly deed over with, so that they could make it home in time for the storm! 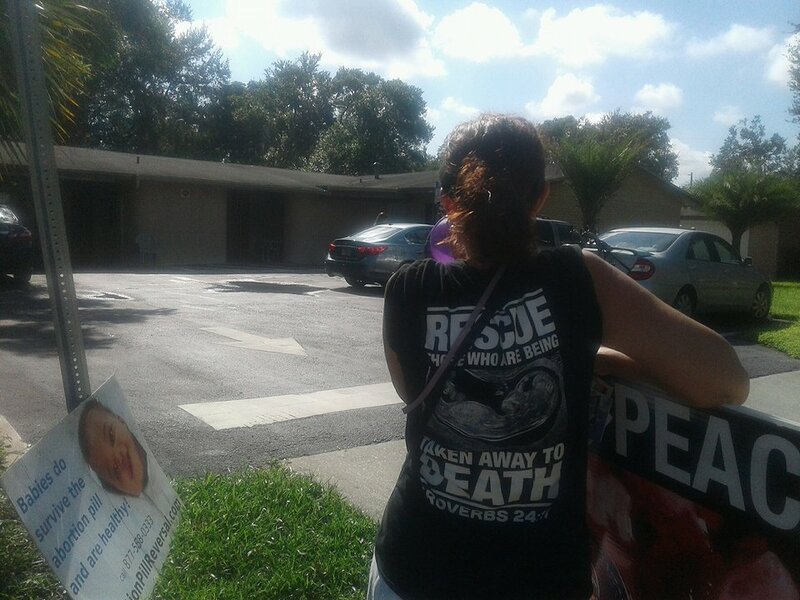 Around 15 little babes lost their lives that day right before Hurricane Irma; dismembered, decapitated, disembowelled or poisoned in the womb.....but you won't hear about that in the news; their little lives will be tossed into the Apopka dump with the rest of the innocent little ones who had no voice. Hugh Hefner Did No Favors for Womanhood!